Peterborough Phantoms launch their play-off challenge tonight (March 22) with a home clash against strugglers Sheffield (7.45pm). The fixture is one of six group games and coach Slava Koulikov believes four wins are needed to finish in the top two of their group and reach the finals weekend in Coventry on April 8 and 9. Also in Phantoms’ group are title-winners Telford and reigning play-off champions Guildford. Phantoms face each team home and away so tonight’s game against Sheffield is a must-win. Phantoms captured the play-off crown in 2014/15, and Koulikov is very clear about what will be required to secure a semi-final passage for the third successive season. He said: “The way I look at it, eight points will guarantee us a place at Coventry, seven points will give us a good chance, but six points might put it out of our hands. “Basically we’re looking for four wins from the six games and it is essential we make the most of our home games. “If we can be successful in all of them and pick up another victory on the road, we should be in a position to get through. “It will be far from easy, though. We have the champions, a very strong Guildford team who have had a tough season by their standards, and a Sheffield side who are capable of turning up and getting results if they’re on song. “The play-offs are like nothing else. Any team can win any game. It is hard and ruthless hockey where every single period matters. “The fact they come around so quickly after the cup final might work in our favour. “The guys were all frustrated to miss out on the cup and they will not need any sort of motivation from me. Sat, Mar 25 – vs Telford (a). Sun, Mar 26 – vs Guildford (h). Wed, Mar 29 – vs Sheffield (a). Sat, April 1 – vs Telford (h). 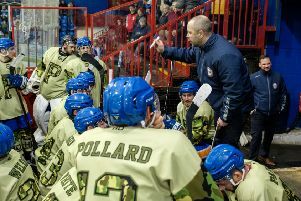 Sat, April 2 – vs Guildford (a).